Believe it or not, TODAY is the actual date of the feast of Corpus Christi. For centuries it was celebrated on the Thursday after Trinity Sunday, and still is in many parts of the world. Pope Francis will celebrate the feast this evening at the Vatican. But like so many things Catholic, here in the United States, we insist on dumbing down the faith. Even the name of the feast is now the “Feast of the Body and Blood of Christ”. We can’t have too much of that old-fashioned Latin stuff, now can we? Many of us who wear the collar are afraid to preach on any controversial topic. We don’t want to offend anyone or, God forbid, cause someone to stop giving money! Then we’re shocked when things like abortion and gay marriage become the law of the land. Here at Saint John Nepomuk we have a lot of weddings. Frankly, I’m surprised when I meet with an engaged couple to do the prenuptial paperwork and they give me two different addresses! Cohabitation, or what we old people used to call “shacking up” or “living in sin” has become the norm, not the exception. Again, cohabitation is a much nicer word. I don’t want to get off on a big rant here, but sometimes I just shake my head at how we’ve let our faith, the faith founded by Jesus Christ Himself, get so watered down. We Christians like to say that the Church is under attack, but the problem doesn’t lie outside the Church, it’s right here, on the inside. We’re letting it happen every day. Recently Ireland, once a devout Catholic country, legalized gay marriage. Church attendance on the Emerald Isle has fallen off to a pathetic low. How a country where the people have been fighting and killing each other over religion for centuries, can become so apathetic about the Lord is a mystery. Unfortunately, the United States is headed in the same direction. OK, I guess I’m done venting, but I hope and pray that Catholics and other Christians will wake up before it’s too late. It’s proves how infinite God’s love is for us that He puts up with our foolishness. After assisting at my third funeral in a week and suffering through my FIFTH dreadful eulogy (Yes, some funerals have more than one) I was wondering why the funeral liturgy is the only mass where lay people are allowed to speak. If family members have something to say at a wedding, that’s what the reception is for. If someone has something to say at a baptism, they save it for the after party. Imagine how long first communion, first penance, or confirmation would take if every parent got up to talk. Only at the funeral liturgy, when family members are in a poor emotional state, do we allow them to speak. According to the Order of Christian Funerals, there is never to be a eulogy at a funeral Mass (OCF 27), although the celebrant may express a few words of gratitude about the person’s life in his homily, or he may allow a relative or a friend to say a few words about the deceased during the concluding rite (GIRM 89). The remarks must be brief and under no circumstances can the deceased person be referred to as being in heaven. (emphasis mine) Only the Church has the authority to canonize. Contrary to common assumption, the purpose of the funeral Mass is not to celebrate the life of the deceased but to offer worship to God for Christ’s victory over death, to comfort the mourners with prayers, and to pray for the soul of the deceased. Relatives or friends who wish to speak of the deceased’s character and accomplishments can do so at a prayer service to be held in a home or funeral home or at the graveside following the rite of committal. Here’s what typically happens. The priest or deacon homilist has done exactly what the rite calls for us to do, that is to offer comfort to the mourners, to celebrate Jesus’ victory over death, and to pray for the soul of the deceased. Having done that and offering Holy Communion to the Catholic’s in attendance, the rite calls for silent reflection followed by the final prayers. Sadly, at many funerals, family members think it’s a good thing to stand up before those assembled and to try to speak. Often they end up making fools of themselves, becoming a teary mess. Who ever thought this was a good idea? Besides making themselves look foolish, they destroy the moment. Whatever peace Father or Deacon has brought to the family is replaced with sadness and sympathy for the eulogist. We humans are a sympathetic bunch. When the speaker breaks down, chances are we’re going to do the same. If a person has been a faithful Catholic all of his (or her) life, shouldn’t their last interaction with the Church on earth be the best it can be. We have professional clergy who have been trained to do the job. Let’s save amateur night for some other occasion. One last thought, notice the sentence in the Catholic Answers quote that I put in bold type. Without getting into too deep a theological rant here, the Church teaches that when we die in a state of grace we will go to heaven after a period of cleansing which we call purgatory. We have no idea how long this period is, it could be minutes or it could be years. We just don’t know. That’s why we pray for the dead. If we thought that our loved one went directly to heaven, what’s the point of praying for them? While we don’t want to talk about grandma being on the outside looking in, it’s not accurate to just assume she’s in heaven. Father Benedict Groschel once said, “The worst day in purgatory is better than the best day on earth.” Plus, once we’re in purgatory, we know we’re going to heaven. That’s what the Church teaches. That’s what we believe. Our HOPE is that we will get to heaven one day. There are no sure things. In fact, (gasp!) some of us aren’t going to heaven. Sorry, but it’s true. It’s just another reason why it’s best to leave these things up to the pros. Don’t our loved ones deserve the best sendoff we can possibly give them? I think they do. The statement seems to contradict itself, whether the Church is true or bad, but today I want to take a look at this idea that the Church is either a cult or a sect. First of all, either term is usually used as an insult, especially when the person using them doesn’t really have anything to say. They hope to get a rise out of us. But, what do the words really mean? Cult: a religion regarded as unorthodox or spurious; also : its body of adherents. (Miriam-Webster on-line dictionary) A good example of a cult which most people are familiar with is the People’s Temple led (?) by Jim Jones. In 1978 419 of this cult’s members committed suicide. Call me silly, but there seems to be quite a difference between the People’s Temple and the Roman Catholic Church. Aside from this little suicide thingy, the other basic difference between Catholicism and a cult, at least according to Webster’s definition is that the Church is neither unorthodox or spurious (deceitful). Everything we believe can be found in Scripture. Remember that for 1,500 years, the only form of Christianity was Catholicism. So, what’s a sect? Going back to M-W online, we find this definition: ” Sect: a dissenting or schismatic religious body; especially : one regarded as extreme or heretical.” (ibid.) There are over 20,000 protestant denominations in the world today. Every single one has it’s basis in Catholicism. Who is dissenting? Who is schismatic? You tell me. Words like cult and sect are useful only in the response they get. Anyone with half a brain, Catholic or not, understands that they don’t apply to the Catholic Church. Jesus did not say “on this cult I will build my Church.” Hopefully Victor will comment again, this time using facts instead of insults. As we approach the biggest day of the year for Irish Catholics (and Irish protestants too) it’s good to give the monks of the Emerald Isle credit for saving Catholic and secular civilization way back in the sixth century. For a detailed description of these events, Thomas Cahill‘s excellent book, How the Irish Saved Civilization is a wonderful resource. This post only skims the surface. The early Irish were fascinated with letters. Since they were poor people, they would often borrow great books and then painstakingly copy them, letter by letter; word by word. They would combine Greek and Roman alphabets with their own Ogham alphabet to create books that were also works of art. 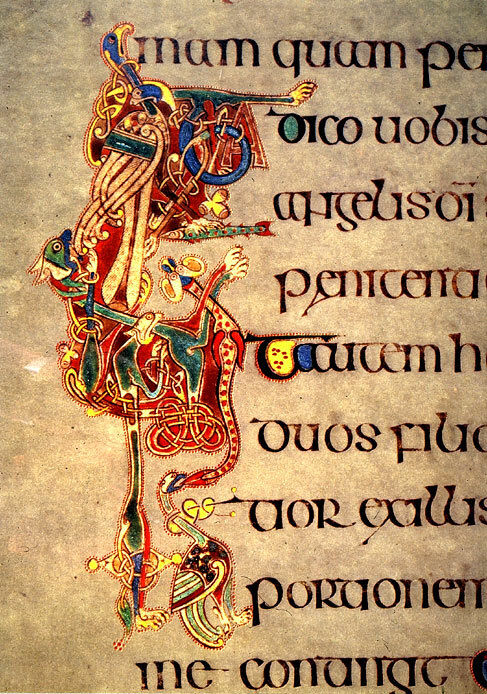 Any visit to Dublin should include a trip to Trinity College to see the Book of Kells, a hand-copied book of Scriptures, created around 800. Monks living in monasteries all over Ireland, as well as several on islands off the Irish shore spent their days copying the great works of European literature. As the barbarians overran continental Europe, the Irish monks were minding their own business, copying everything they could get their hands on. In the process of conquering the Continent, the barbarians destroyed the literature of the past. The past was obliterated, except on that tiny island in the North Sea. To make a long story short, the barbarians couldn’t be bothered conquering a small, desolate island like Ireland, so the literature of Greece and Rome lived on in the monk’s libraries. While the continent suffered through the “Dark Ages”, the Irish were keeping the candle lit and would bring the light back to the Continent, possibly flavored with a little Irish wit and humor. The “White Martyrs”, so named because they sailed off into the white horizon never to return, would replant the seeds of ancient civilization in the many monasteries they founded all over Europe, even as far south as present-day Italy. So, when we read the ancient works of the great Greek and Roman writers, we have to assume that the Irish monks copied them exactly as written. But who knows, since they all passed through Irish hands, there might be just a little bit of blarney here and there. It’s cool the the Irish Catholic monks of the Emerald Isle kept this great literature alive, especially if you happen to be a descendant of the Auld Sod yourself. And this weekend, who isn’t? Tomorrow: What do you think? And so began the Roman Catholic Church. We’ll get into the subject of the Pope in a later post. (Hint: He’s in the top 10.) What I want to talk to you about today is our amazing history. Think about it. Jesus began with twelve Apostles, just barely enough for a soccer team. Today His Church numbers more than 1 Billion members. We’ve had our highs and we’ve had our lows, but as Jesus predicted, even the gates of hell (the netherworld) haven’t prevailed against. Oh, they’ve tried, and I’m not just talking about today’s news. Over the centuries, political powers have tried to snuff out the Church. More than once Catholics have found themselves to be criminals because the government has made the practice of the faith illegal. Masses have been said in people’s homes, behind hedge rows, even in prison. But the Church always prevails. The first serious challenge to the Church didn’t happen until 1517 when Martin Luther nailed his 95 Theses to the Cathedral wall. Even though Luther didn’t intend to start a new church, that’s how things worked out and the Lutheran Church was born. It was a perfect storm. Gutenberg invented the printing press, more people were learning to read, and Luther’s abbreviated Bible was all the rage. Suddenly anyone who had a beef with the Roman Church has someplace else to go. Don’t misunderstand. I’m not criticizing anyone’s belief system. All Christians worship the same God. All the rest is just details. Someday, hopefully, we’ll all be reunited in a single Church. But I digress. The history of the world would be so different if it weren’t for the Catholic Church. In spite of what some of the politically correct would have you believe, we even count the years based on the year Christ was born. Since the time of Christ, every great civilization has had an official position on Catholicism. Some were for us. Some were against us. But you can’t deny the effect. This list is hardly comprehensive (There are more than 20,000 protestant denominations) and some of the dates may be in dispute, but I hope you get my drift. Two thousand years of western history have been driven by the rise and fall and rise again of the Catholic Church.